The president's plane has some old refrigerators, so for $24 million he is getting new ones. The U.S. Air Force is going on a million-dollar shopping spree for refrigerators — and you're paying. Air Force One needs a new set of refrigerators. It'll cost taxpayers nearly $24 million. Why so much? Well, for starters, they're big: almost 70 cubic feet, and they're being tricked out with all the bells and whistles that a presidential ice box might need. According to Defense One, they have to be able to store about 3,000 meals for weeks, without restocking. And the Air Force can't exactly get them off the rack — the fridges have to be specially designed to fit the highly modified airplane and withstand special testing. The cost of that is included, too. The refrigerators that are currently on the jet are the originals — circa 1990. They're causing the crew some problems these days. 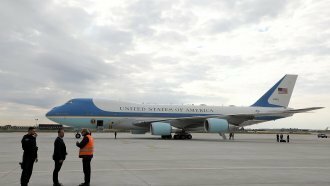 It's worth noting that President Donald Trump was highly critical of how much taxpayer money was going into Air Force One. He slammed a deal with Boeing to modify two 747-8s to replace the planes that currently carry the president. He said it was going to cost more than $4 billion. Boeing's CEO later promised to make it happen for less than that.